•Lined with 80gsm bubble, UCGOU padded envelopes are made of heavy duty 100% virgin plastic, which have a good stretch, lightweight and water-resistant, not the cheap ones that are poorly padded or have glue everywhere. They seal well and the padding is sufficient. The bubble mailer envelopes provid more protection during transit as compared to basic poly mailers and don't add too much bulk, as a result the shipping is so much cheaper than the complicated larger packages. •Tape, wrapping film and corrugated cardboard box......This is too much trouble when you prepare to ship items. It's time to say bye to the troublesome!! •Come to UCGOU! Send your package in clean, simple but grand style which would help to upgrade your company professional image. Believe us. High-efficiency mailers would really stand out and make your customers smile when they opened their mailbox. DIMENSION. 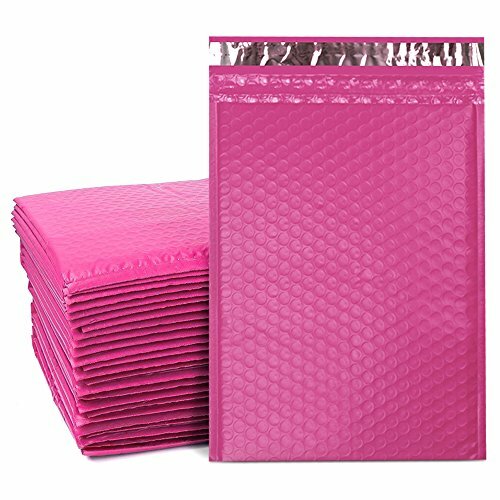 8.5x12 inch padded envelopes (usale size-8.5x11"), outer with pink poly film. The bubble envelopes feel nice to the touch and are perfect for handwriting, labeling and stamping. CUSHION MAILERS. These are pink mailer envelopes lined with 80gsm bubble. The padding is sufficient to mail the items that needed protection. Keep your product safety.